Live Blog: Watch the Nintendo Switch Nindies Showcase - Live! Full embed is now above for your viewing pleasure. I thought that was a darn good effort, thoughts? Finished. It was all games, but there were lots of them. Lots of exclusives and 'first' releases there, not bad Nintendo! Create your own battlefields, this looks really neat. Online and local multiplayer, nice. This looks interesting, 12 campaigns? That's a Switch console exclusive in March, woah. Out first on Switch in April. Oh yes, it's Vblank baby! Mr. Shifty, lots of warping around and melee combat. First on Switch this April. Graceful Explosion Machine is out in April. Graceful Exploding Machine, a wacky looking shooter. Keep your eyes peeled on the site, we have an interview about Flipping Death coming up right after the broadcast. Here's Blaster Master Zero, which popped up in the Japanese eShop list last week. Some nice angle transitions there, coming this fall. Kingdom: Two Crowns now, reveals coming fast! Will be a 'timed exclusive' on Switch, nice! Multiplayer will be a fun extra here, for sure. "It's our mission to find unique experiences"
Damon Baker is our host, we like him. Looks like the original formula, but certainly with more environmental twists. Oh, right into it, we have SteamWorld Dig 2! I'm really glad Nintendo's doing this Nindies Showcase - I consider it part of my mission to highlight that the eShop is full of goodies, and the Switch store is looking pretty decent early on. So, what's your biggest hope for this stream? Loads of Nindies games? Stuff about the eShop features / UI? Virtual *cough* Console? To be realistic, this will be less than 30 minutes, as 'localised' versions by the likes of Nintendo UK are due to go live 30 mins after the stream. Considering the topic new download games are pretty much guaranteed. What will hopefully be interesting will be stuff on the eShop design, features, maybe the online service. Virtual Console details for its future release. Hey, we can dream. This is all rather nice, so as you can see in the handy video countdown this starts at 9am Pacific / noon Eastern / 5pm UK / 6pm CET. I think it could be rather good. Just watched the second half. I got called out half way through to make pancakes!!! Can I guess which bit you're cringing at? So the NUK video is basically unchanged, ah well. no, dual strike was only wireless local or card download. Not sure how to feel about War Groove. I'm a huge fan of Advance Wars. The game is pretty much AW but I think a bit too much so. I think they should've made it stand out on its own. or "all my games are on this tiny sd cards,where's yours?" or even, wheres your second controller ? yep,or "does it have a detachable kick stand"
OorWullie, or even, "oh yea, well is your game portable"
even these times exclusives,when they do eventualy land elsewhere ,we can say "but do they have HD rumble"? I love the fact that the first time we will all see the eShop is actually on launch day. At least it will be something exciting to look forward to. Out of the newly revealed games, I'm getting at least SteamWorld Dig 2, Runner 3, Overcooked and Flipping Death. This was a great Direct. so anyone want to donate to my gaming fund? What does a 'non-mediocre' Nindies Direct look like? When they say local multiplayer for Stardew Valley, does that mean multiplayer on the same console, or through a LAN connection? Mediocre direct. Where are all the first party games? Would have loved to see some other popular steam titles on there to take on the go. Hyper Light Drifter comes to mind. Any of these games coming to the C64? Are any coming to the Revolution though? Man, wish they had showcased Celeste, but regardless, I've never been excited for so many indies! Interview is up in 10 mins on the homepage. Are any of these games coming to the NX? Peace and I'm outta here! @ThomasBW84 stay here for the interview or another link? I'm happy we have these titles to help fill the gaps between major releases. back to work peace I'm out. Didn't think they would show this much! I need more! wargroove... hey intelligent systems, I know you love your Fire Emblem and all, but how about making a new Advance Wars, yeah? Is it Friday yet ?? WarGroove, Shakedown Miami, Escapists 2, Steam World Dig 2, lot's of good stuff! Time out, I'm out, sayonara. Wargroove looks amazing. It fills the gap that leaves Advance Wars. Excited for Blaster Master...but a little disappointed overall with the presentation. did wargroove say it had online? Oh man they said they would show Nindies and that's what they did.. still I would have loved to some additional Switch news. That was terrible. Terribly AWESOME! Going to need to spring for the larger SD card, glad I waited. Nice lineup overall, Yooka-Laylee is where I'll be at. is controller integration any good in Stardew Valley? Can't wait to play this!!! I just got here, what is this? SAY WHAT?! LEVEL editor! and sold sold sold! OH! AWESOME! Not Advance Wars! I love that Nintendo are supporting the indies making strong spiritual successors to their dormant franchises. So FE and AW had a baby? oh gosh... it's more Advance WARS! advance wars meets fire emblem? Wow! it's like the NeoGeo Pocket KoF, Fatal Fury, and Gals Fighters! Haha, that's a pun on Hard Ticket to Hawaii. please have multiplayer in this ..
16 bits it's double the fun! is runner 3 part of the bit trip runner series? that looks more fun that the first one. I wonder how many of these games are coming out on the wii u as well? let see if I actually take the time to finish this one. Oh wow, a sequel to that? Binding of Issac news pls? This is a cute genreblend. a e i o u? la li lu le lo? are you dead azelf ? Are these dates US only? Graceful Exploding Machine? Wins best name. i hate that artstyle but the game looks fun. They're firing off indy announcements faster than "bullets" in 1-2 Switch. I need my switch now! so what you are saying is I need to buy an eshop card on friday? i cant see the pesentation is runner 3 by any chance part of the bittrip runner series? have I missed anything good? ...so I will be very broke this year. I keep throwing money at the screen, but I'm not playing them! Geez, that series is still going strong! I've seen almost all these games on Steam. Team 17 are the team behind Worms,It would probably have been shown there. oeh kingdom I'm gonna check out! Pixels - this is not a 3DS Damon!!! @tiwo91 Or that. I'm fine with that. They're not letting up on the reveals, eh. I n t e r n e t . . .
Was that the whale from Flapjack? SO far this is what i want out of a direct. quick announcements and gameplay! This can't be a long presentation. They're firing off like 3 titles a minute here. Aw, no Worms, but I've never played Escapists before, so I'll try it out. I'd been looking to play Gonner! Was hoping he was going to say Worms. Did not see this coming! Really? No date? Just "really soon"? ok so the first 2 games im buying... my wallet will be crying after this presentation. Wowwww the music is really good! Yooka-Laylee reminds me so much of the original Spyro. Not sure why. Big question, April 11th or later? not really excited for this but it looks nice...ill try it. Team17... Please tell me Worms will be announced as well! And Overcooked! Games, Damon, show me the games!!! Was "ninteresting" really the best you could come up with? Yo waddup let's DO THIS! that look SOOOO good and now i dont have to buy it twice! oh crap, starting off strong! Didn't I&F say there was a non-sequel for the switch? Is this just one of two switchgames? Haha, them voltbots getting it. starting off with the second dig! My internet, don't fail me now! Any second now, I hope. Oh, the new Toejam and Earl would be awesome, too! I mean i know its been confirmed, but do we know WHEN? Huh, tinyBuild just tweeted out the stream... perhaps we'll see Clustertruck or Fight Club on Switch? I cooked up my classic Belgian Waffles and sausage meal that I used to eat all the time watching Directs. Feels good to be back to old habits. about 30 mins. Promo material comes out in 30 mins. Educated guess. I just want Spelunky and Overcooked... Although is Overcooked even an indie? yes, anyone know how long this is gunna run for? Will there be surprises? Something not yet announced at all? back on topic, really curious for stardew valley! Is Minecraft considered an indie game anymore? Do we know how long the showcase is? It has a section for the stream too. `A man's gotta hope right? @Gerbwmu Sometimes it works perfectly, and sometimes it just doesn't work. It's a mystery. C'mon, Big N - I want a sizzle reel to end all sizzle reels. Light up internet! Is Monter Hunter considered an indie... ... ... xD. I admire the self-censorship going on here. I think it's just gonna be a showcase of Nindies, with a few developers giving some explanations. So is this stream gonna be like a Treehouse, or will it be "fancier" than that? @Grumblevolcano you think the Switch subscription is going to be more than $120 a year? Hey everyone! Looking forward to this. @ThomasBW84 - getting ready? I was born readier than a box of Shreadies! I'd happily pay £10 a month to play the full library of NES, SNES, and N64 titles on the Switch. GAME Sweden has gone bankrupt... They used to sell cheap retro games. I bought Mario Paint from them a long time ago. Is Pushmo technically indie? I thought it was published by Nintendo. Now if only Nintendo would do something similar with the Virtual Console. Welcome back. My Pro Controller is on its way now. It is time. I'm sure plenty of people would be willing to pay $10 a month to play 100 games from this gen and last gen. 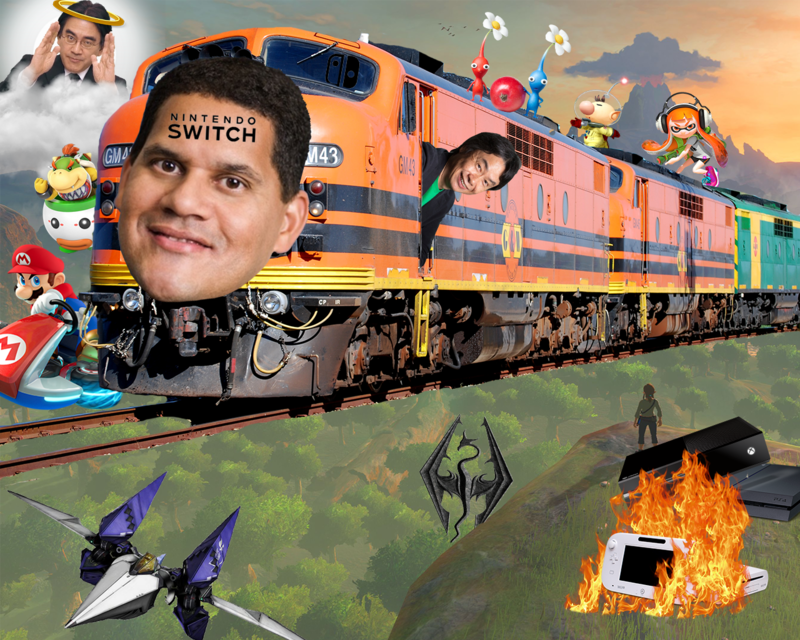 I wouldn't have thought there would be any Nintendo-produced games revealed... but here's hoping! Yeah I tried PS Now for research on an article. Meh. @ThomasBW84 Yet a better move than Sony's PS Now, which is incredibly over expensive. Crikey, big move by MS. I'm really looking forward to completely overhauling my Mii with the updated Mii Maker. @SadHorse I'm sure they would. Lots of indies make visual novels. Man, I'd really love some visual novels for the Switch, would they count as indies? I ordered the 'starter kit' case from Ninty. I'm scared to take this thing outside without a proper case. Anyone else get emails from Nintendo today telling them their stuff has been dispatched? Please forgive me Gerbwmu, I'll never do it again! Jeez! That's some impressive cheek. Looking forward to this! Some of the indie titles released recently have looked really enticing! I did enjoy spending more on SMM than some people do on their first car. I'll never go back after Super Mario Maker-gate. Yeah, I just added gate. @BLP_Software But aren't we on the internet RN? Back in line at Game.co.uk live chat.... position 41 in the queue.... again! If youre a Nintendo fan, don't go out onto the internet. Its like being crucified. oh no. i must leave. hopefully i make it back in time. will there be stability updates? I'd take Pokémon Shuffle on Switch if there'd be a way to transfer the save from 3DS. At least the UK will be independent. So UKIP loses its purpose and buggers off. Still waiting on StarForce 3 Capcom, thank you. "Batteries were flat"... is that a UK thing? It wouldn't be censored. XCX has a 12 rating with murder, suicide genocide and a vivid retelling of a gruesome murder. Kids are fine. Will there be a Live Blog for the EU versions of this 'direct'? Or not? so like 20 minutes from now? Yes. Beer. You wimp. Be a manly man and have something powerful. Something that punches you as you drink it. Like Pyukumuku mucus. Anyone know what time this goes live? 12 pm EST?? @G-boy sorry, what wont happen? Are you playing on Lunatic? what time does this start in the UK? @TossedLlama Itoi said that it wouldn't happen. As soon as we leave this site the negativity just piles on. Like people really trying (Bless em) to find hardware faults. @BLP_Software Yeah and that's why I'm not annoyed about the VC situation. Having VC at launch would just pretty much be setting Nindies up to fail. @TossedLlama Btw, there's still a chance to get the characters from the last event. I got a 4 star Eirika from that same summon as well . I guess my dream announcement here is Yooka-Layle on day one, but oh well. Its why I'm making a yummy yummy switch exclusive. mmhmm delish. To be fair, its nice Nintendo gives indies the time of day and exposure they deserve. I'd like to see Virtual Console kept out of this. Indies releasing eShop games on launch deserve a bit of leg room. Otherwise people spend their $10 on Mario World again. I'm not expecting new exclusives, just a rehash of known titles and maybe some ports from other systems. Or "asset flips". Whats that? A unified account system. Hahahahaha thatll never happen....wait....it has. What did you say Grumble - setting themselves up for Mother 3?!?!?! did you fuze them, or level them seperate? Okay so indies are cool on the switch but its not cool on the wii u. Do you remember when they said "NX will not feature in this presentation"
Has anybody been playing FE Heroes lately? the stream is doing things, not exciting things, but things. @gcunit No, they were using the bathroom. did you combine Whiskey with paint drying watching? What... so they clear up for you? even if you were, you are entitled to your own opinions ! @gcunit Somebody else in my family was there. Phew! De-escalate people. Put the hammer away, Lz. @TossedLlama Piss off. Don't compare me to those idiots. I need to go to the loo, BRB. Adding Iwata in the background of that pic was "tasteful"
Ooh, this I'm much more excited about than spoiling my Zelda fun by watching pirates stream Breath of the Wild. ...just checked - I'm still 36th in queue, started at 41! Not exactly a 'lively' chat then is it, gcunit? Lol. Game. Theyd turn around and say ""Nintendo? F off"
@buildz OK, maybe it was a big announcement for you, but it wasn't for me. Seeing the Smash Logo is an immediate hype explosion. Seeing Metroid logo, even just a tease of anything from Retro, is big. @BLP_Software I don't really think that was a big announcement. I feel like this video is too short for Nintendo to be able to make a big announcement. What's the betting this video won't include anything we don't already know? @Gerbwmu Yes, the video is thirty minutes long. will 40 mins be enough time? I'm gonna watch GameXplain's new discussion video about BoTW until the video starts. I'd rather the eshop was as basic as possible. I just want to buy games on it. anyone know how long this vid will be? Haha, not sure why the logo is so epically big, but Anthony is aware of it. I can't justify buying Shovel Knight again. I already have it on Wii U, 3DS, PS3/4/Vita. Its a digital storefront. As long as it isn't PS3 store bad, we good. giant logo......for GIANT NEWS??????? What do you know Thomas!!!! We just need to know a lot more about the Switch in general...it isn't make sense to go into launch knowing as little as we do. Wow, why is the Nintendo Life logo so big? @Gerbwmu In other words you won't know anything about the system until you know everything haha. I would double-dip because of the portability! The Hype for Undertale has lessened largely, I doubt it would sell at all.